In the USA, 17th May 2017 was recognised as D.I.P.G awareness day by 22 states thanks to the Michael Mosier Foundation. This date is significant to them as it is the date that Michael passed away after fighting D.I.P.G. They are working to get these states and more to recognise this day again for 2018. We believe that we need a similar day of awareness here and therefore want to extend the awareness day to the UK on the 17th May 2018. D.I.P.G stands for Diffuse Intrinsic Pontine Glioma. This is a grade IV tumour which is highly aggressive and currently considered untreatable in the UK. It originates in an area of the brainstem called the pons. The pons is responsible for vital bodily functions such as breathing, swallowing, blood pressure, sleeping, eyesight and balance. On average, 25-30 children a year are diagnosed with DIPG in the UK, that is equal to about a classroom full of children. There is no known medical reason for a child developing D.I.P.G. Due to its location in the centre of the brain and the diffused nature of the tumour, it is not possible to surgically remove it. Standard chemotherapy is also not an option due to the blood brain barrier ‘protecting’ the tumour. Radiation is usually offered to help shrink the tumour however due to its aggressive nature this will only prolong life for a short while. The median age of survival is 9 months with doctors usually stating between 2 weeks and 2 years. Only 10% of children survive past 2 years and less than 1% survive for 5 years. In 50 years, cancer research has helped us improve survival rates for a lot of different cancers, however there is no difference in the treatment now to 50 years ago for DIPG sufferers. Here, parents (as DIPG is most common in children aged between 5 and 10) are told to go home and make memories. As the tumour takes hold, the vital bodily functions are impaired. However, the sufferer’s knowledge and understanding is not affected, therefore they are fully aware of what is happening to them, they simply cannot control it, becoming locked inside their own body. It has to be one of the most cruel ways to suffer. We need to spread awareness. We need to get people talking about this, not ignoring it. Yes it is rare but it’s not rare enough. Less than 4% of funding available goes into children’s cancer research, and even less again goes into brain cancer research. We need the politicians talking about this more. Dame Tessa Jowell has recently called for improvements in fighting cancer and last year a Scottish policitian even addressed parliament about DIPG and the doctors in Monterrey, Mexico, at the Instituto de Oncologia Intervencionista hospital, who are seemingly finding ways to treat this tumour using Intra-arterial chemotherapy and immunotherapy. Sadly there were not many politicians present. During Channel 4’s Great British Bake Off – Stand Up to Cancer, aired on 3rd April 2018, a story was told by parents about their son who had battled DIPG but sadly lost his life to it. It had people searching for further information about the young boy and learning about it. This is the type of awareness we need. The more awareness and understanding there is, the better. It plays a significant role in both the research and care for DIPG. We would love for as many people as possible to get involved with some sort of fundraising on May 17th, to help raise funds and spread awareness of this horrible disease. 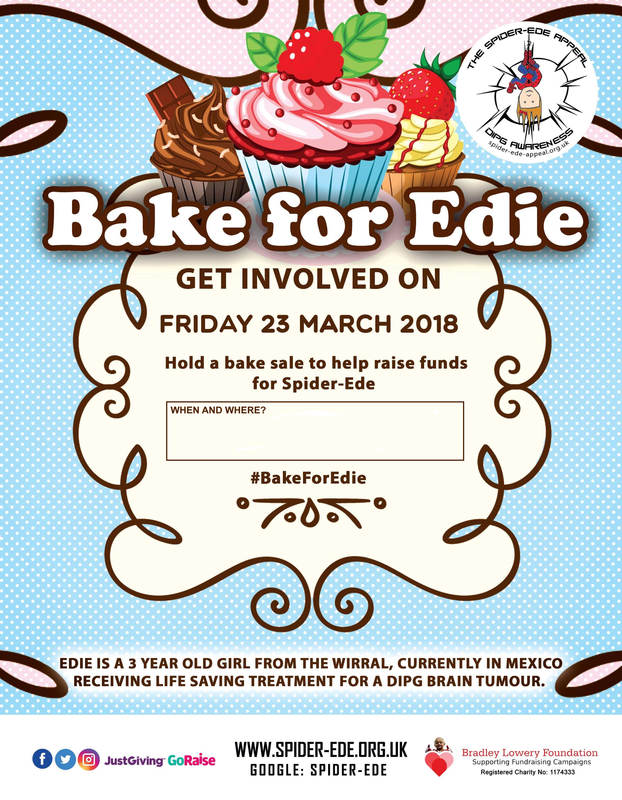 Our own event will be our second #BakeForEdie day, hopefully we can beat the first one held on 23rd March, which raised in excess of £5000 for the Spider-Ede Appeal. 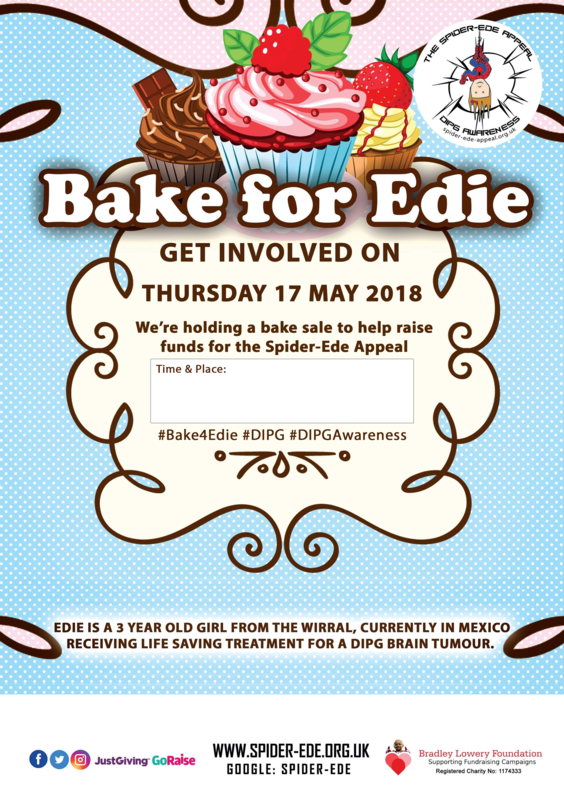 However, if baking isn’t ideal for you then please consider some activity to help us spread the word, whether it’s a sponsored walk, run or even silence, or a raffle within your place of work. Maybe a non-uniform day at school? We do need to raise vital funds for treatment, but we also want people to know and understand what the 17th May is all about, and what DIPG is. So, if all else fails, please just tell someone who may not know about it. Explain it to them, direct them to this page. Let’s get people talking more. Personal donations/collections can also be made into our Halifax bank account. Companies can make a charitable donation to our Bradley Lowery Foundation account. 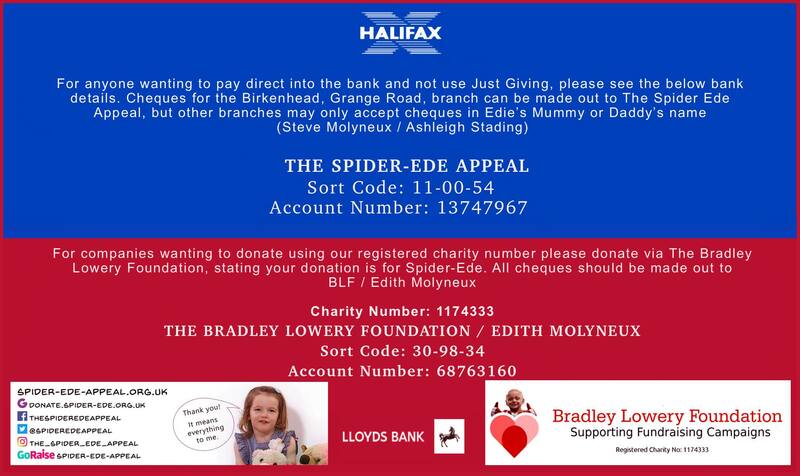 Please make cheques payable to The Bradley Lowery Foundation/Edith Molyneux. Bank details for direct transfers can be provided on request.